When searching for material to record, at least for much of the first two decades of the idiom, rock vocal groups had a tendency at times to reach back to established pop tunes in an attempt to put their own spin on something familiar by re-arranging these standards to suit their own unique strengths. In some cases the results were pretty daring – for the time at least – and while it was surely done with an eye on “crossing over” into broader (read: Caucasian) pop acceptance, oftentimes it had the opposite effect, as the results seemed almost sacrilegious to those who preferred their songs as plain as dry white toast. 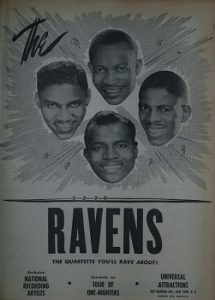 The Ravens, as befitting their role as the first – and one of the most influential – rock vocal group, had helped to set the precedent for cross-stylistic song appropriation as their radical re-interpretations of such classy material as Ol’ Man River showed how shocking the transformation could be in the right hands. But while at times they’d surely seem to many to be staging a non-violent coup of the accepted order of things musically, they’d also grown up listening to some of the blander records on which many of these songs were first heard, appreciating them for their own qualities far removed from what they themselves were making their name with now. Thus with an eye on reaching a wider audience groups like The Ravens often wound up toning down their natural instincts at reinvention for a more by-the-numbers approach, which probably pleased no one. The pop audience likely still found Jimmy Ricks’s cave dwelling bass voice too intimidating while the rock audience felt they were being cast aside for the more lucrative white night clubs and stabs at mainstream radio play. So while the songs themselves that they might’ve chosen were solid compositions ripe for a new twist, doing so was still a precarious proposition aesthetically and so the results were often hit or miss. Or sometimes even both at once. Sammy Cahn would seem like an unlikely lyricist for any song that would see release as a rock record, let alone one covered by so many rockers over the years. After all with 31 nominations he’s the most honored songwriter in Academy Award history, winning four statuettes over the years. He was also a longtime favorite of Frank Sinatra’s, penning such classics for Ol’ Blue Eyes as Come Fly With Me (1958), High Hopes (#30 Pop, 1959) and Love Is The Tender Trap (#7 Pop, 1955). As if being at Sinatra’s beck and call wasn’t keeping him busy enough he also managed to contribute Three Coins In The Fountain (#1, 1954 by The Four Aces), Ain’t That A Kick In The Head (known for Dean Martin’s 1960 rendition) and the Christmas standard, Let It Snow! Let It Snow! Let It Snow! to the American songbook in his spare time. Notice there’s not a rock song among them. But his first copyright was Rhythm Is Our Business for the true father of swing music, Jimmie Lunceford, which was as hip as anything for 1935 so he definitely had the sensibilities to be open to anything. In 1936 he wrote Until The Real Thing Comes Along for Andy Kirk & His Clouds Of Joy, a top notch jazz outfit in their own right. While the arrangement for it is pretty standard pop faire, nothing revolutionary or cutting edge, it IS a tremendous song in its construct and really could be used as a how-to in songwriting, even today, because all of its components were so well crafted. The lyrics manage to present the played-out theme of being love-struck in a way that’s both hapless and hopeful without pandering to either side of the equation. The stanzas offer the extremes to which the narrator will show his love to someone who’s presumably not reciprocating, yet he justifies that with the chorus which elevates the sentiments from borderline pathetic to pure devotion. It’s clever without being cloying and their relationship to the melody is sublime. As was the case back then it was the song itself more than a particular version that would become popular and as a result lots of big names took a crack at it, most notably Billie Holiday, Fats Waller and The Ink Spots. As great as all of those names are however, the song – to my ears anyway – never lived up to its potential in any of their hands. Holiday was a bit too detached in her reading, I don’t believe for a second she was pining for anyone when listening to her sing this which is vital to making it connect emotionally with an audience. Waller on the other hand is far too irreverent, indicating he’s almost ashamed to admit these feelings and so he undercuts it with humor to distance himself from the emotional weight of it. Meanwhile The Ink Spots, as often was the case with them, are too mannered and unemotional, giving the sense that while they might be sincere they are more concerned with how they’re being viewed by the outside world while delivering this message of love rather than focusing only on how they’re connecting to the girl of their desires and doing all they can to convince her of their urgency. Yet the song itself was golden and so it remained ripe for a truly defining interpretation of it, something which seemed right up The Ravens alley. When looking back at all of the various takes on the song chronologically I’d say The Ravens version was indeed the best to date but it too isn’t all it could be which has a lot to do with the bugaboo touched upon in the first section of this review – the desire for pop appeal. 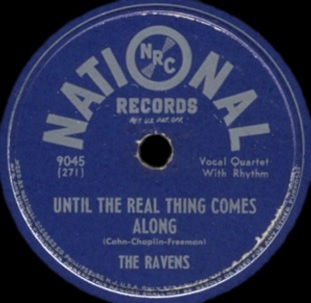 Though it’s not as pronounced here as it was with The Ink Spots (though to be fair, that group cut it in 1942, a different universe than 1948 when it comes to commercial possibilities), The Ravens still tend to err on the side of caution too much, a common foible they, and most rock vocal groups, fell prey to when sensing a chance to connect with listeners outside of their core fan base. Yet when Jimmy Ricks is involved there’s always a BUT to follow any criticism of their more tentative approaches, for if there’s one thing we know – with him around there’s just no way to completely stifle that soulfulness. Howard Biggs’s piano bar opening may have you envisioning tuxedoed waiters mincing around a smoke filled room in low lighting as Clark Gable wanna-bes at each table order another bottle of champagne they can’t afford to impress their high society dates, but that vision is shattered when Ricks enters the room with a drawled “Bay-bee” and the others fall in behind with understated harmonies that are miles beyond The Ink Spots clipped version. Thirty seconds in when Jimmy injects an extra syllable into the word “Well” you begin to think this might be shaping up to be something truly transcendent. If anyone can convey the right mix of urgent longing while still maintaining their masculine self-respect it’s surely Jimmy Ricks. But unfortunately when he steps aside the others betray him just a bit. They’re all excellent singers, which by this point on Spontaneous Lunacy should go without saying, and their first refrain on their own is delivered quite solidly. Maybe a slight drop-off in terms of mood but that’s to be expected, not only because they’re supposed to offer a change in tone for the bridge but also because they’re relieving a singer against whom ANYONE would seem a decided step down. When Ricks returns that contrast seems entirely appropriate and the song works better for it, re-energizing us as it heads down the stretch, still aiming squarely for a big green number. That’s when The Ravens stumble. They don’t fall down, they’re certainly not killing its chances at connecting overall, but after going along so confidently… they inexplicably pull back and severely dampen the enthusiasm. It’s an interesting thing about the timing of their misstep. 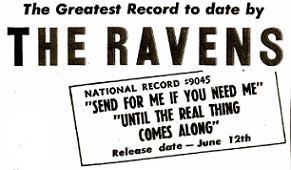 The Ravens version of Until The Real Thing Comes Along, like most renditions of the song, clocks in at over three minutes, yet in of all the takes on it I’ve heard (and in writing this review that’s over thirty different artists I compared and contrasted) it’s the ones which chop up to a full minute off the time which seem to work best. Furthermore, it’s not as if they all leave the same part out of the song, a glaring weak spot that should’ve been excised from the start. In fact, some merely save the time by speeding the pace, or not repeating a chorus an extra time. It’s also not that the more condensed ones which I prefer always have “better” arrangements, or rather that they don’t have the stately “good music” arrangements that cause them to fall well outside the rock spectrum. Nope, Big Maybelle’s version is pretty ornate and yet it works in a way that Jackie Wilson’s longer high-class affair does not. But we’re talking about The Ravens and where this one goes slightly off track, dragging it down to earth a bit in the process and surprisingly it comes at a point in the song when they often were at their absolute strongest and most creative – the coda. When we hit 2:19 it sounds at first as if they’re wrapping things up. The harmonies wind down, the piano adds a tinkly closing refrain and Ricks gives one last weary moan of resignation. But then it seemingly jumps into another song, yet it’s the same song, but just not nearly as good. Codas can be an excellent addition when done right, a cherry atop the sundae, an after dinner mint and a cognac rolled into one. When done badly though they tend to make you forget the good meal you just enjoyed and leave you with a touch of indigestion. It’s not quite going to have you reaching for a napkin and some Tums, or worse yet looking around frantically for a bathroom, but their old-school styled harmonizing in the last minute takes this out of the present… the this may be a pop tune but we’re doing it as a rock ‘n’ roll harmony number attitude… and places it back in the pre-rock era of polite and dainty open throated unemotional singing. Even the subdued guitar accompaniment sounds imported from another era. They sing it fine for how they approach it, and Maithe Marshall’s brief solo unto itself is alright (helped in no small part by Ricks answering him and emphasizing their contrast), but it’s not how they’d led us to believe they were doing it and that’s where the disconnect is. We came along willingly with them this far, trusting that they were sticking to the style we in the rock audience preferred, the one they themselves excel at, but then at the last moment they pull a switch almost as if they’re trying to stop the older blue-haired couples in the club from walking out on the rest of the show. It doesn’t sound as if those haughty blue-bloods bothered turning around because finally in the closing seconds Ricks returns with a decidedly unsentimental closing which at least gives a reassurance that they didn’t abandon us completely. That may leave us with a smile on our faces, but it’s a bit like being comped on the bill for a bad dish. You’d rather pay full price and have a flawless meal than have to send something back to the kitchen. The dinner here isn’t ruined, The Ravens still walk away with the best recording of the song to date but it’s not quite all it could’ve been, nor even all it was shaping up to have been two-thirds of the way through. Thus we’re left feeling a bit frustrated that the older gentry still has some sway, and will continue to have undue influence for quite a bit longer especially in instances where groups tackle songs from outside their own nests. Just for the record though, since we won’t be reviewing it as it wasn’t released at the time, the all-time hands down BEST version of Until The Real Thing Comes Along was done by a rock vocal group after all. In 1957 The Harp-Tones, led by the magnificent Willie Winfield, did this about as well as a song could ever be done, a hauntingly beautiful version that is both modern sounding for the style they sang in, yet still respectful of the dignified origins that pre-date rock altogether. It is truly magical. While The Ravens certainly improved upon what had come before it they wind up with only a slightly higher than average rock release for its day… By contrast The Harp-Tones would’ve gotten a big, fat green ten for theirs because unlike The Ravens they made no unnecessary concessions. In the end, at least around here, you’re better off remembering who made you what you are and it’s that constituency that needs to be satisfied first and foremost. For two minutes The Ravens did just that, but in a three minute song that’s not quite enough. Leave a reply on "The Ravens: “Until The Real Thing Comes Along”"